Name Variation Johann Jantzen was also known as Janssen. [S236] Roger and Leslie Fedde, The Fedde's of Jewell County Kansas, page 47. Name Variation Johann Fidde was also known as Fidden. 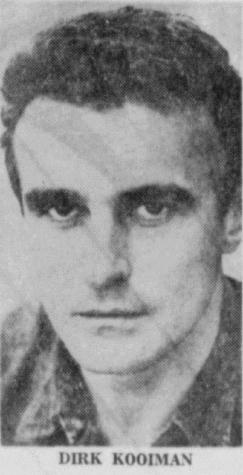 Name Variation Johann Fidde was also known as Fedde. Name Variation Johann Fidde was also known as Junge. Johann Fidde was born in May 1657 at Dorpstedt, Hollingstedt, Schleswig-Holstein, Germany. He was the son of Johann Fidde and Ide Barm. Johann Fidde was probably reasonably wealthy as he was a godparent to many children. He attended church and took communion often. Also, when he was ill, the pastor would come to his house and administer communion. He was often accompanied by his wife and the older children. Confirmation records have been found for several of the children. He was called Old Johann Vedde in his burial record, and also called Johann Fidde, senior. The oldest son, Johann, was often called Junior.7 Johann Fidde was a farmer. 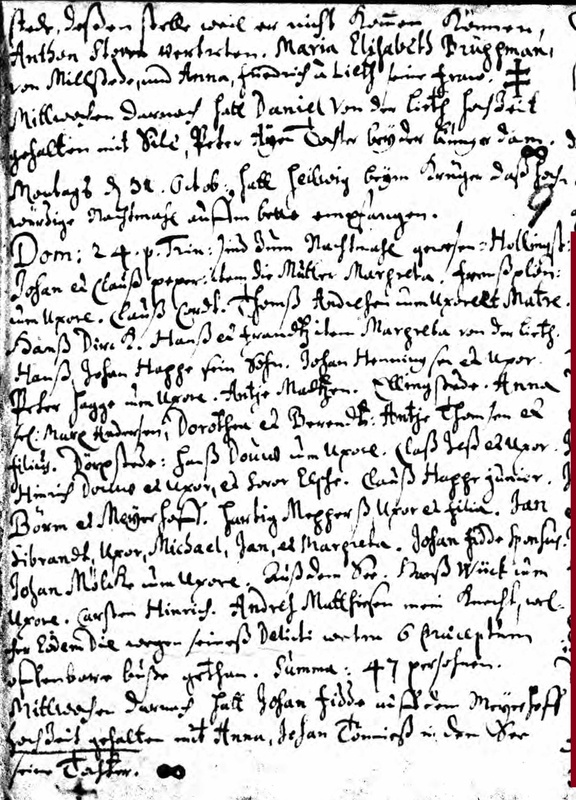 [S408] Lutheran Church, German Lutheran Church Records 1567-1945, Page 28. FHL Film Number 1198918. 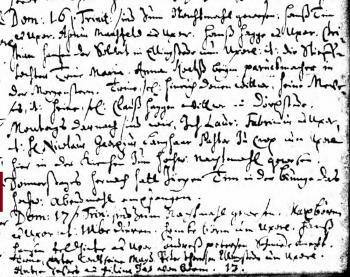 [S408] Lutheran Church, German Lutheran Church Records 1567-1945, Page 9. FHL Film 1198918. 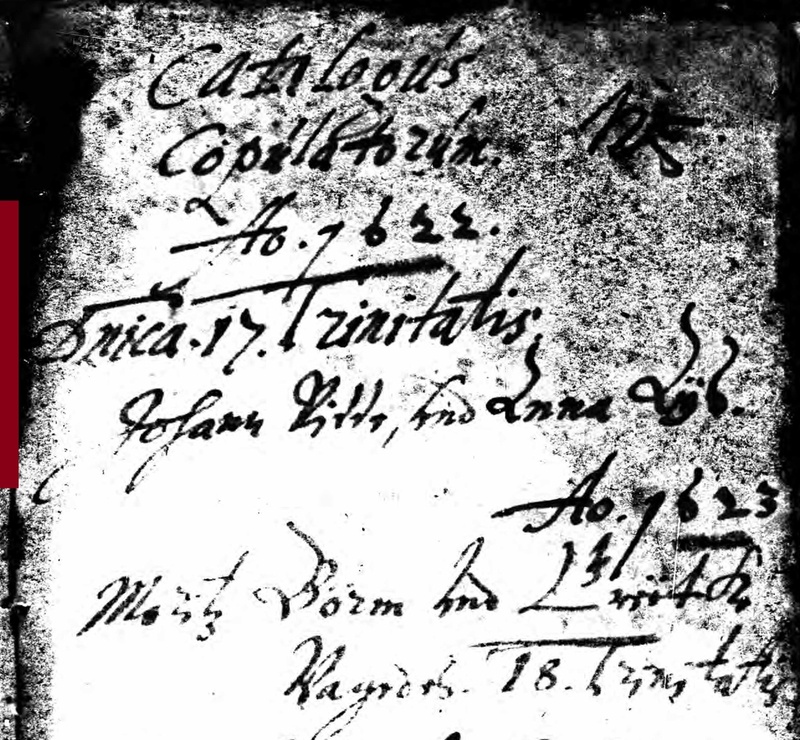 [S408] Lutheran Church, German Lutheran Church Records 1567-1945, (death date noted on baptism record). [S406] Lutheran Church, German Lutheran Church Records 1518-1921, image 300 of 533. [S236] Roger and Leslie Fedde, The Fedde's of Jewell County Kansas, page 40. Name Variation Anna Tonnies was also known as Antje. Name Variation Anna Tonnies was also known as Tönnies. 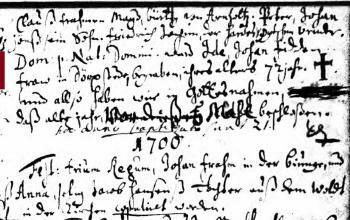 Married Name 16 November 1692 As of 16 November 1692,her married name was Fedde. She was the daughter of Johann Tonnies. Name Variation Johann Fidde was also known as Vedde. 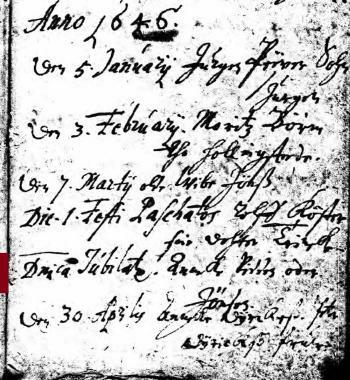 Johann Fidde was born in 1626 at Dorpstedt, Hollingstedt, Schleswig-Holstein, Germany. He was the son of Johann Jonsen Fidde and Anna Katharina Ays. [S408] Lutheran Church, German Lutheran Church Records 1567-1945, Page 55. FML Film Number 1198918. [S408] Lutheran Church, German Lutheran Church Records 1567-1945, Page 35. FML Film Number 1198918. Name Variation Ide Barm was also known as Börm. Name Variation Ide Barm was also known as Gretie. Name Variation Ide Barm was also known as Borm. 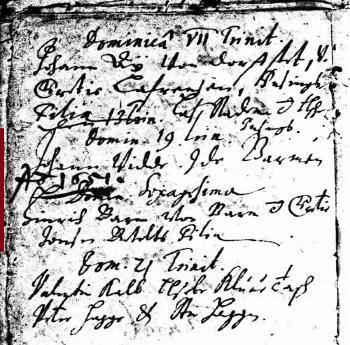 Married Name 20 October 1650 As of 20 October 1650,her married name was Fidden. 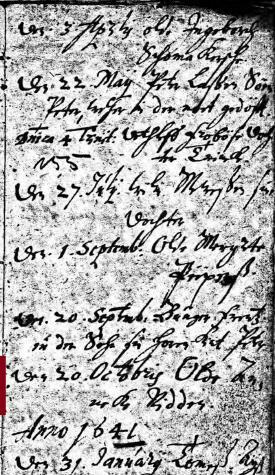 Married Name 20 October 1650 As of 20 October 1650,her married name was Fedde. Ide Barm was born in 1627 at Germany. She was the daughter of Hinrich Börm. [S408] Lutheran Church, German Lutheran Church Records 1567-1945. 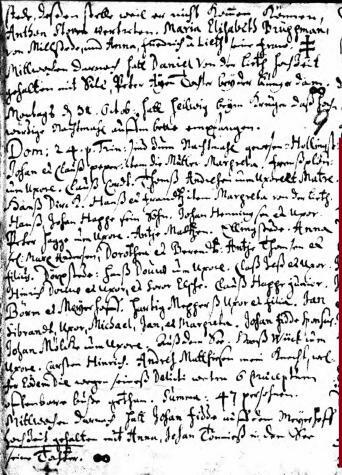 [S408] Lutheran Church, German Lutheran Church Records 1567-1945, Page 47. FML Film Number 1198918. Name Variation Johann Jonsen Fidde was also known as Fidde. Name Variation Johann Jonsen Fidde was also known as Ridden. Name Variation Johann Jonsen Fidde was also known as Vedde. Name Variation Johann Jonsen Fidde was also known as Johann Fedde. Johann Jonsen Fidde was born in 1590 at Germany. He was the son of Johann Fedde and Ann Eke. 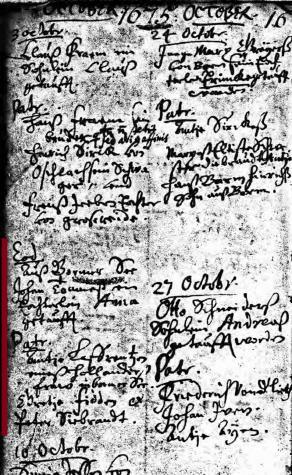 [S408] Lutheran Church, German Lutheran Church Records 1567-1945, Page 192. FML Film Number 1198918. Name Variation Anna Katharina Ays was also known as Aÿs. Name Variation Anna Katharina Ays was also known as Anneke. 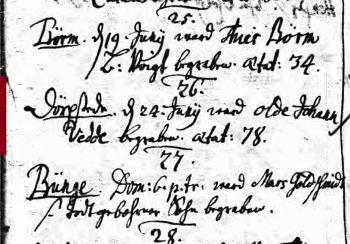 Married Name 1622 As of 1622,her married name was Fedde. 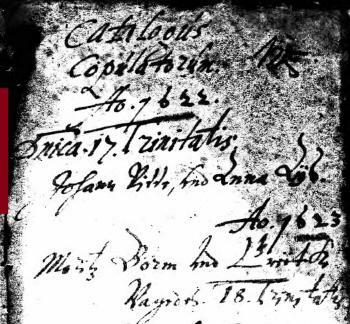 Married Name 1622 As of 1622,her married name was Ridden. 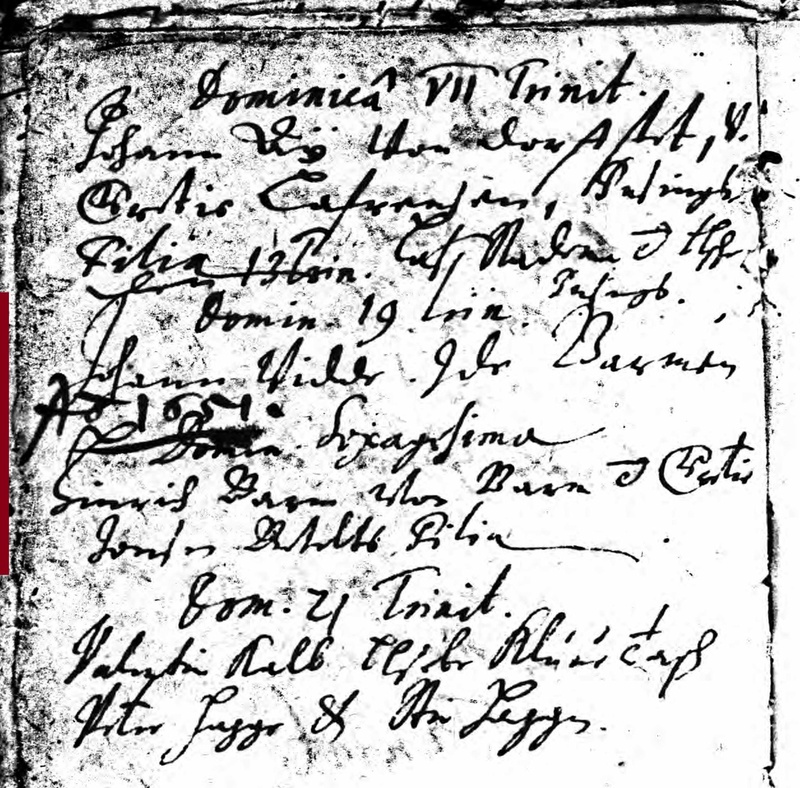 Married Name 1622 As of 1622,her married name was Fidde. Anna Katharina Ays was born before 1607. Name Variation Johann Fedde was also known as Fidde. Name Variation Johann Fedde was also known as Vidden. Name Variation Johann Fedde was also known as Vidde. Johann Fedde married Ann Eke. Johann Fedde was born in 1560 at Germany. He was the son of Johann Fedde. Married Name Her married name was Fidde. Married Name Her married name was Fidden. Ann Eke married Johann Fedde, son of Johann Fedde. Ann Eke was born before 1575 at Germany. She died in October 1640 at Germany. Johann Fedde was born in 1530 at Germany. He died in 1570 at Hollingstedt, Schleswig-Holstein, Germany. Johann Fedde was a innkeeper and farmer. Nickname Hannah Wilhelmina Groon also went by the name of Babe. 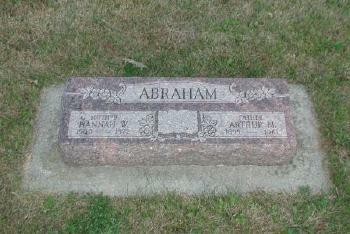 Married Name 8 March 1922 As of 8 March 1922,her married name was Abraham. She was the daughter of John Gerhart Groon and Nellie Johnson. Hannah Wilhelmina Groon died on 6 October 1972 at age 72. She was buried on 10 October 1972 at Union Creek Cemetery, Union, South Dakota. Hannah Wilhelmina Groon obtained US Social Security Card at Iowa; last residence Sioux City, Woodbury, Iowa. On 4 July 1950 at Union Creek Lutheran Church J G and Nellie (Johnson) Groon 50th wedding anniversary. 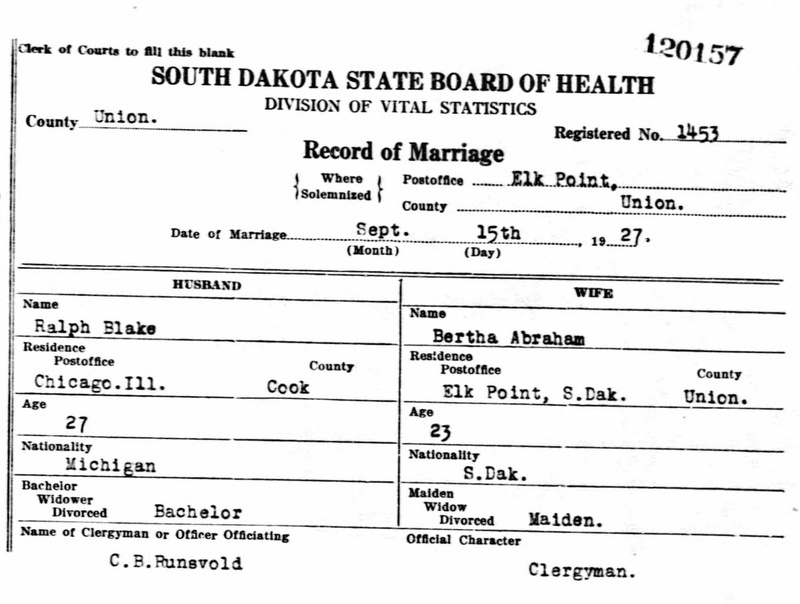 [S9] South Dakota, South Dakota Birth Records South Dakota, State File Number: 775896 (unknown file date). Name Variation Percy Alonzo Green was also known as Percival. Percy Alonzo Green was born on 18 September 1900 at New Hampshire. He was the son of Harry M. Green and Agnes Bertha Sullivan. As of 1920, Percy Alonzo Green was never married. He married Florence Lemon before 1936. Percy Alonzo Green married Bertha O. Abrahamson, daughter of Ole Andreas Abrahamson and Anna Mathiasdatter Eide, on 25 May 1960 at Los Angeles, Calilfornia, her name listed as Bertha Blake. Percy Alonzo Green obtained US Social Security Card; reported by California Death Index. He and Florence Lemon lived in 1936 at Los Angeles, California. Percy Alonzo Green and Florence Lemon lived in 1938 at Los Angeles, California. [S243] U.S. Federal Census 1920 U.S. Federal Census, by Ancestry.com, Year: 1920;Census Place: Boston Ward 23, Suffolk, Massachusetts; Roll T625_740; Page: 9A; Enumeration District: 555; Image: 517. [S250] U.S. Federal Census 1930 U.S. Federal Census, by Ancestry.com, Year: 1930; Census Place: Los Angeles, Los Angeles, California; Roll: 149; Page: 22A; Enumeration District: 438; Image: 203.0. Name Variation Ralph V. Blake was also known as Ralph L.
Ralph V. Blake was born on 11 July 1900 at Michigan also reported as 11 Jul 1901. He was the son of Phineas Vincent Blake and Elsie Fuller. 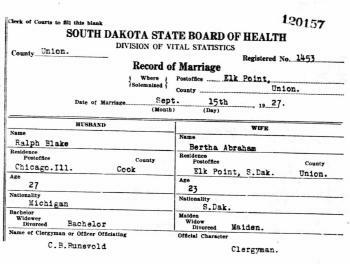 Ralph V. Blake and Bertha O. Abrahamson were divorced after April 1930. Ralph V. Blake obtained US Social Security Card at Illinois; last residence Redlands, San Bernardino, California. [S244] U.S. Federal Census 1910 U.S. Federal Census, by Ancestry.com, ED13. Dwelling 100. [S243] U.S. Federal Census 1920 U.S. Federal Census, by Ancestry.com, ED50. Dwelling 311. Name Variation Jeanne B. Kantowski was also known as Jean B. 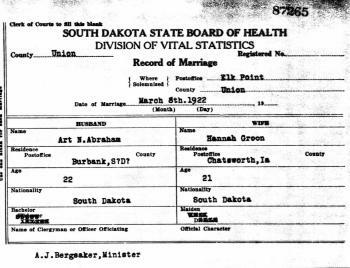 Married Name before 1944 As of before 1944,her married name was Abrahamson. Jeanne B. Kantowski was born on 5 September 1916 at Pierre, Hughes, South Dakota. She was the daughter of Leo Alexander Kantowski and Jessie Lenore Borst. Jeanne B. Kantowski married Oscar C. Abrahamson, son of Ole Andreas Abrahamson and Anna Mathiasdatter Eide, before 1944 at Santa Monica, California. She was buried after 5 October 1944 at Pierre, South Dakota. Jeanne B. Kantowski and Oscar C. Abrahamson lived in 1944 at 1310 15th St., Santa Monica, Los Angeles, California. Jeanne B. Kantowski was a housewife in 1944. Francis Albert Greenheck was born on 30 March 1925 at Richland Center, Richland, Wisconsin. He was the son of Albert Greenheck and Marcella F. Kaney. 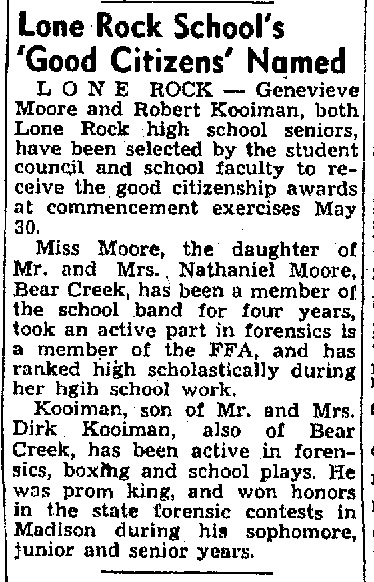 Francis Albert Greenheck married Bonnie Ann Veronica Duren, daughter of Rinold Nicklas Duren and Anna M. Murphy, in May 1949. Francis Albert Greenheck died on 6 December 1996 at Olmsted, Minnesota, at age 71 WABASHA -- The funeral for Francis A. Greenheck, 71, of Wabasha, will be at 11 a.m. Monday at St. Felix Catholic Church in Wabasha with the Rev. Gerald Conway officiating. Burial will be in the St. Felix Cemetery with military rites by Wabasha American Legion Post 50. Mr. Greenheck died Friday (Dec. 6, 1996) at St. Marys Hospital in Rochester. He was born March 30, 1925, in Richland Center, Wis. He attended rural school in Iowa County, Wis., and attended Lone Rock High School in Lone Rock, Wis. He also attended the University of Wisconsin. He served in the Navy during World War II in the Pacific Theatre. He was in business with his father in Iowa County where they operated the Biglow Cheese and Butter Co. until 1949. He married Bonnie Duren in May 1949 at Cazenovia, Wis. They moved to Wabasha in 1949, where he operated the Lake View Creameries from 1949 until 1969. He then operated the Nelson Cheese Factory in Nelson, Wis., from 1969 to 1994 when he retired. He served one term on the St. Felix School Board and two terms on the Wabasha School District School Board. He had been active in tree farming in Wisconsin and Minnesota. He was a member of the board of directors for the Alma Bank, and was a member of Wabasha American Legion Post 50, and St. Felix Catholic Church. He is survived by his wife; three sons, Edward of Wabasha, Michael of Eagan, Minn., and Peter of St. Paul; five daughters, Mary Greenheck of Altoona, Wis., Anne (Mrs. Marc) Hanson of Rochester, Elizabeth Greenheck of Wabasha, Joan (Mrs. Steve) Faulhaber of Menomonie, Wis., and Jennifer (Mrs. Eric) Christianson of Wayzata, Minn; 16 grandchildren; a brother, Joseph ``Bud'' of Madison, Wis; two sisters, Kitty Rae (Mrs. Larry) Duren of Middleton, Wis., and Mary Ann (Mrs. John) Lindh of Madison. Francis Albert Greenheck obtained US Social Security Card at Minnesota; Last residence Wabasha, Wabasha, Minnesota. [S190] The Richland Observer, 12 Dec 1996. [S329] Minnesota Death Index, 1908-2002 (published), State File Number: 034777. Name Variation Robert Dirk Kooiman was also known as Bob. 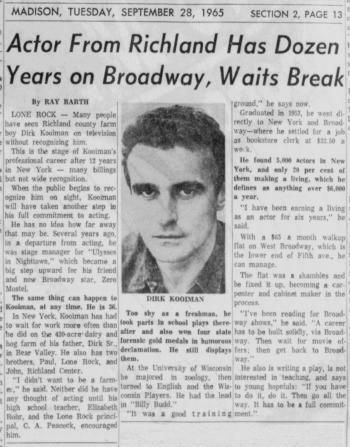 Nickname Robert Dirk Kooiman also went by the name of Dirk. Robert Dirk Kooiman was born on 5 March 1929 at South Dakota. Robert Dirk Kooiman obtained US Social Security Card at Colorado; last residence Los Angeles, Los Angeles, California. 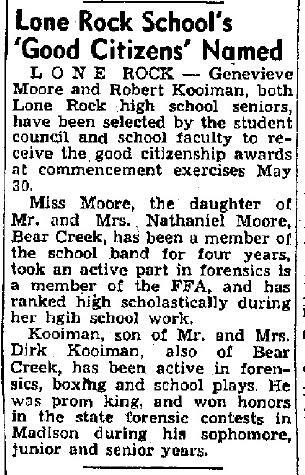 In May 1947 Robert Kooiman is Lone Rock Good Citizen. He lived in 1964 at New York City, New York. In September 1965 Dirk Kooiman, actor on Broadway. [S190] The Richland Observer, 17 Mar 1994. Married Name 28 December 1989 As of 28 December 1989,her married name was Peck-Holmes. Married Name 28 December 1989 As of 28 December 1989,her married name was Holmes. Patricia A. Kaney was born on 1 April 1944 at Richland Center, Richland, Wisconsin. She was the daughter of John Daniel Kaney and Anna E. Blass. Patricia A. Kaney died on 13 November 2015 at age 71 ST. GERMAIN/MADISON–Patricia A. Peck-Holmes, age 71, of St. Germain, passed away on Friday, Nov. 13, 2015. She was born on April 1, 1944, in Richland Center, the daughter of John and Ann (Blass) Kaney. She married Terry Holmes on Dec. 28, 1989, in Madison. Patricia graduated from St. Bernard's Catholic grade school and Madison East High School. She was proud of her Irish heritage and family. Patricia worked as a teller for Bank of Madison, which later became M&I and worked her way up to Assistant Vice President. She loved the outdoors, cheering on the Badgers and Packers, walking, feeding the birds, watching wild life, and her dog, Max. 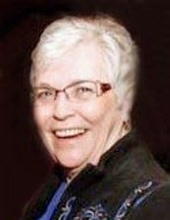 Patricia is survived by her husband, Terry; children, Dana Peck and Daniel (Melissa Matula) Peck; father of her children, Al Peck; step-son, Zachary (Karyn) Holmes; grandchildren, Caleb Peck, and William and Owen Holmes; brother, John (Sharon) Kaney; sister, Rosemarie (Paul) Kobussen; nieces and nephews, Joane (John) McCarthy, Jeanette (Tate) Scott, Jacquie (Barry) Robbins, Jolene (Bob) Butler, John (Julie) Kaney, Daniel (Morgan Fong) Kobussen, Kathryn (Michael) Fenner, and Colleen (Allen) Kamai; and great-nieces and nephews. She was preceded in death by her parents. A memorial service will be held at GUNDERSON EAST FUNERAL HOME, 5203 Monona Dr., Madison, at 1 p.m., on Thursday, Nov. 19, 2015, with Father Michael Radowicz presiding. Visitation will be held at the funeral home from 11 a.m. until the time of the service on Thursday. Patricia A. Kaney lived in 1976 at Cottage Grove, Dane, Wisconsin. Name Variation Dr. Ernest Downing Sadler was also known as Ernest Dowing. Name Variation Dr. Ernest Downing Sadler was also known as E. D.
Name Variation Dr. Ernest Downing Sadler was also known as Saddler. 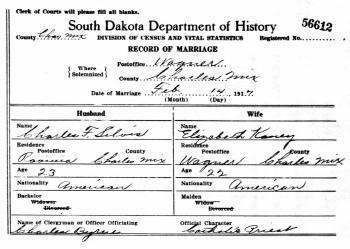 Dr. Ernest Downing Sadler witnessed the marriage of Charles Hrdlicka Jr. and Kathryn Genevieve Kaney on 4 May 1910 at Wagner, South Dakota. 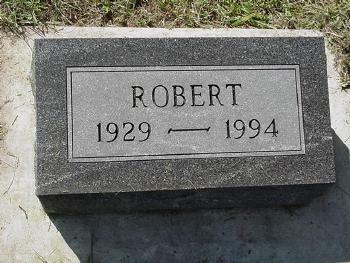 He was buried on 2 March 1961 at St. John's Catholic Cemetery, South Dakota. Dr. Ernest Downing Sadler was a veterinarian. He obtained US Social Security Card; as reported by California Death Index. He was a veterinary surgeon in 1909 at Charles Mix, South Dakota. He purchased land on 6 May 1915 at Township 95N Range 64W, Charles Mix, South Dakota, Section 32 Acreage:80 Type 253500 Casetype PA DocID 471633. 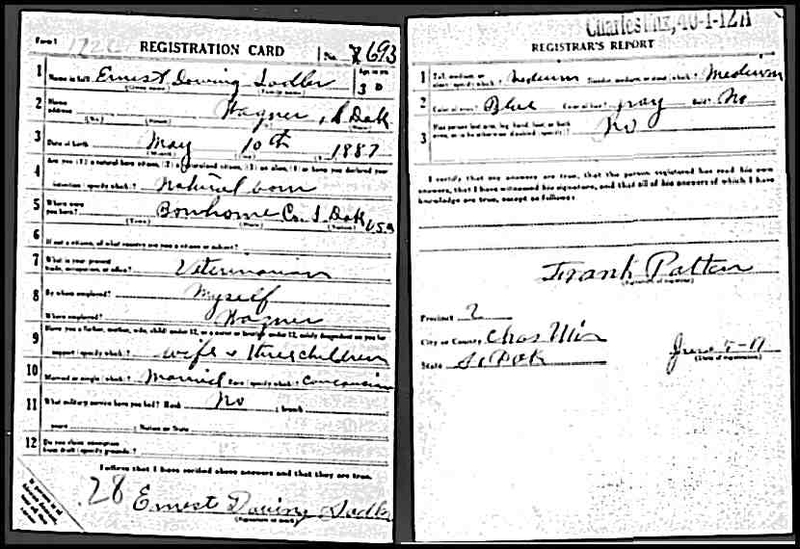 On 5 June 1917 at World War I Draft Registration, Charles Mix, South Dakota, wife & 3 children. He purchased land on 11 January 1919 at Township 94N Range 63W, Charles Mix, South Dakota, Section 22 Acreage:40 Type 253500 Casetype PA DocID 658773. He purchased land on 19 May 1919 at Charles Mix, South Dakota, Township 94N Range 64W Section 3 Acreage:40; Township 95N Range 64W Section 34 Acreage:80; Township 95N Range 64W Section 35 Acreage:80 Type 253500 Casetype PA DocID 678211. He purchased land on 13 January 1920 at Township 97N Range 63W, Charles Mix, South Dakota, Section 25 Acreage:40 Type 253500 Casetype PA DocID 727150. On 1 May 1960 at Charles Jr and Kathryn Hrdlicka - 50th wedding anniversary. 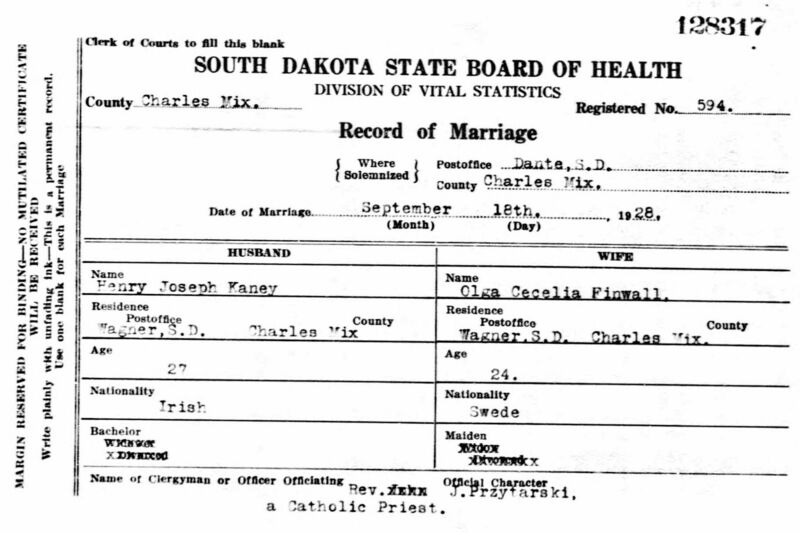 [S9] South Dakota, South Dakota Birth Records South Dakota, State File Number: 768990 (unknown file date). 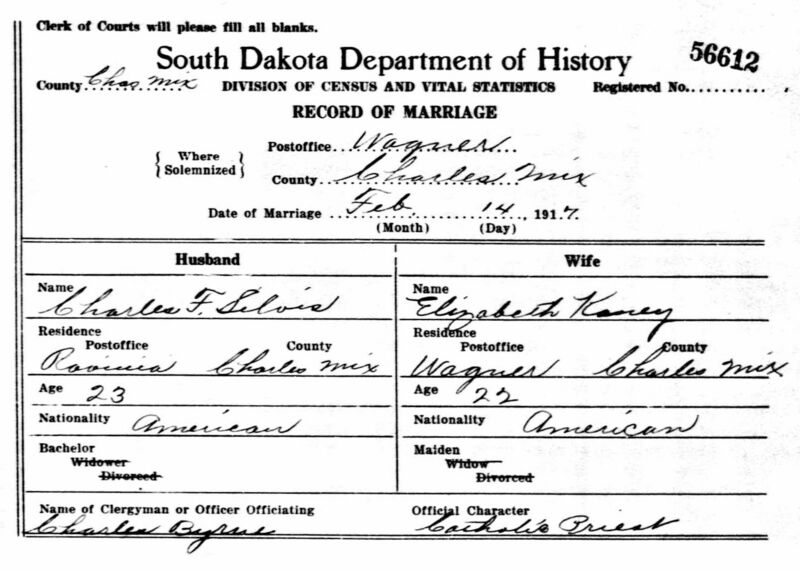 [S342] South Dakota, South Dakota Marriage Certificates, 1905-1949, Marriage Date: 06 Jul 1910. 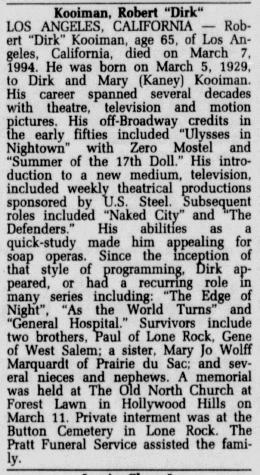 [S218] The Wagner Post, March 1961. Nickname Elizabeth M. Kaney also went by the name of Lizzie. Married Name 14 February 1917 As of 14 February 1917,her married name was Silvis. Elizabeth M. Kaney was born on 24 February 1895 at South Dakota. She was the daughter of Patrick Henry Kaney Jr. and Margaret Ann Kane. Elizabeth M. Kaney died on 1 December 1982 at age 87. 1905 South Dakota Elizabeth M. Kaney appeared on the census of 1905 in the household of Patrick Henry Kaney Jr. at South Dakota; wife and son Henry aren't included in the census index. Elizabeth M. Kaney obtained US Social Security Card at South Dakota; last residence Centerville, Turner, South Dakota. She had eight children. Name Variation Rose Winfred Kaney was also known as Rose Wilfred. Married Name 7 September 1911 As of 7 September 1911,her married name was Stancer. Rose Winfred Kaney was born on 21 October 1885 at near Kimball, Brule, South Dakota. Rose Winfred Kaney married Fredrick B. Stancer, son of James L. Stancer and Emma J. Kennicotte, on 7 September 1911 at Wagner, Charles Mix, South Dakota. 1905 South Dakota Rose Winfred Kaney appeared on the census of 1905 in the household of Patrick Henry Kaney Jr. at South Dakota; wife and son Henry aren't included in the census index. Rose Winfred Kaney obtained US Social Security Card at Minnesota; last residence Hector, Renville, Minnesota. She had three children. [S329] Minnesota Death Index, 1908-2002 (published), State File Number: 006971. [S243] U.S. Federal Census 1920 U.S. Federal Census, by Ancestry.com, ED50. Dwelling 19. [S250] U.S. Federal Census 1930 U.S. Federal Census, by Ancestry.com, ED22-11. Dwelling 63. [S373] U.S. Federal Census 1940 U.S. Federal Census, by Ancestry.com, Year: 1940; Census Place: Paxton, Redwood, Minnesota; Roll: T627_1951; Page: 2B; Enumeration District: 64-21. Name Variation Fredrick B. Stancer was also known as Fred. Fredrick B. Stancer was born on 18 July 1885 at Iowa. 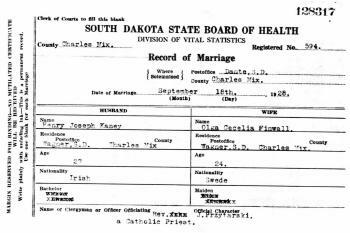 Fredrick B. Stancer married Rose Winfred Kaney, daughter of Patrick Henry Kaney Jr. and Margaret Ann Kane, on 7 September 1911 at Wagner, Charles Mix, South Dakota. 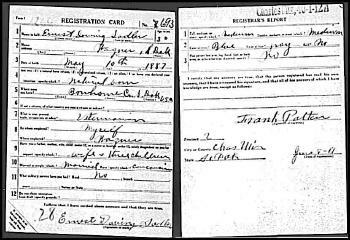 Fredrick B. Stancer obtained US Social Security Card at Minnesota; last residence Hector, Renville, Minnesota. In January 1905 load of oats hit by train. On 12 September 1918 at World War I Draft Registration, Charles Mix, South Dakota. In May 1928 Fred Stancer has been sick, and many neighbors helped sow oats and corn. [S329] Minnesota Death Index, 1908-2002 (published), State File Number: 011685 for Fredrick B. Stancer. [S329] Minnesota Death Index, 1908-2002 (published), State File Number: 011685. [S245] U.S. Federal Census 1900 U.S. Federal Census, by Ancestry.com, ED18. Dwelling 232. Name Variation Nellie Ellen Kaney was also known as Ellen. Married Name 18 January 1923 As of 18 January 1923,her married name was Taylor. Nellie Ellen Kaney was born on 12 December 1893 at near Kimball, Brule, South Dakota. Nellie Ellen Kaney married Dr. W. H. Taylor on 18 January 1923 at Denver, Colorado. Nellie Ellen Kaney died on 25 August 1925 at Wagner, Charles Mix, South Dakota, at age 31 Wagner, S. D. Sept 8 - Mrs. Nellie E. Taylor, 32 of Wagner, died from a complication of diseases at the home of her parents, Mr. and Mrs. P. H. Kaney of Wagner. 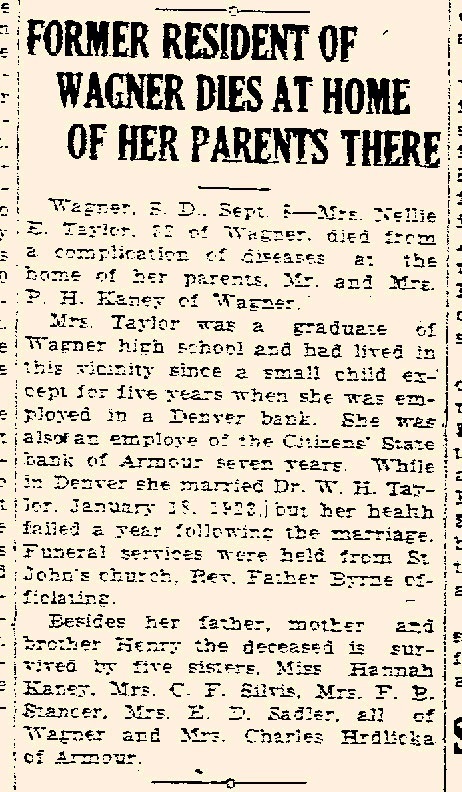 Mrs. Taylor was a graduate of Wagner high school and had lived in this vicinity since a small child except for five years when she was employed in a Denver bank. She was also an employee of the Citizens' State bank of Armour seven years. 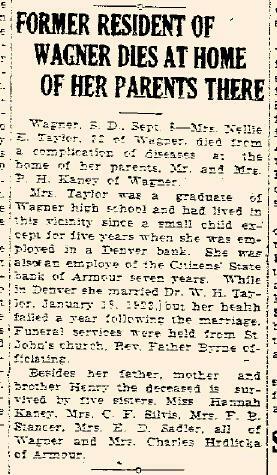 While in Denver she married Dr. W. H. Taylor, January 18, 1923, but her health failed a year following the marriage. Funeral services were held St. John's church, Rev. Father Byrne officiating. Besides her father, mother and brother Henry the deceased is survived by five sisters, Miss Hannah Kaney, Mrs. C. F. Silvis, Mrs. F. B. Stancer, Mrs. E. D. Sadler, all of Wagner and Mrs. Charles Hrdlicka of Armour. 1905 South Dakota Nellie Ellen Kaney appeared on the census of 1905 in the household of Patrick Henry Kaney Jr. at South Dakota; wife and son Henry aren't included in the census index. Nellie Ellen Kaney had zero children. [S267] South Dakota Cemetery Records, by Ancestry.com, Lot 48. Grave 6&7. [S243] U.S. Federal Census 1920 U.S. Federal Census, by Ancestry.com, Sheet 3A. ED81. Dwelling 66. Dr. W. H. Taylor married Nellie Ellen Kaney, daughter of Patrick Henry Kaney Jr. and Margaret Ann Kane, on 18 January 1923 at Denver, Colorado. Name Variation Hannah Anne Loretta Kaney was also known as Ann. Hannah Anne Loretta Kaney was born on 1 April 1896 at South Dakota also reported as Apr 1897. As of 1974, Hannah Anne Loretta Kaney was never married. She died on 15 June 1974 at age 78 also reported as 05 Jun 1974. 1905 South Dakota Hannah Anne Loretta Kaney appeared on the census of 1905 in the household of Patrick Henry Kaney Jr. at South Dakota; wife and son Henry aren't included in the census index. Hannah Anne Loretta Kaney obtained US Social Security Card at South Dakota; last residence Wagner, Charles Mix, South Dakota. Henry Joseph Kaney was born on 16 April 1901 at Kimball, South Dakota. He was the son of Patrick Henry Kaney Jr. and Margaret Ann Kane. Henry Joseph Kaney died on 16 June 1970 at at home, Wagner, Charles Mix, South Dakota, at age 69 Henry Kaney obituary. 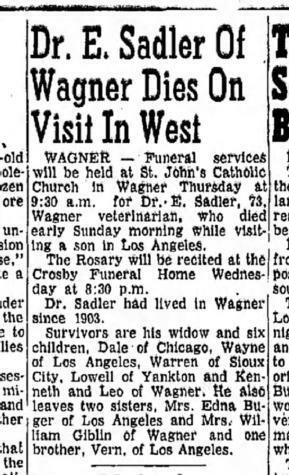 He was buried on 19 June 1970 at Wagner Cemetery, Wagner, Charles Mix, South Dakota. Henry Joseph Kaney obtained US Social Security Card at South Dakota. He was a Official 1969 Charles Mix County, South Dakota Farm & Ranch Directory. Kaney, Henry Post Office: Wagner 1, Bryan Twp, Section 31 Owns Farm. in 1969 at Bryan Twp, Charles Mix, South Dakota. Name Variation Olga Cecelia Finwall was also known as Olga Victoria. Married Name 18 September 1928 As of 18 September 1928,her married name was Kaney. Olga Cecelia Finwall was born on 24 July 1901 at Sweden. She was the daughter of Johannes Finwall and Johanna Persson. Olga Cecelia Finwall died on 23 March 1991 at Sioux Falls, Minnehaha, South Dakota, at age 89. She was buried on 26 March 1991 at Wagner Cemetery, Wagner, Charles Mix, South Dakota. Olga Cecelia Finwall obtained US Social Security Card at South Dakota; Last residence: Sioux Falls, Minnehaha, South Dakota.. She immigrated in 1916. Name Variation Anne Lykken was also known as Ane. Married Name 5 September 1928 As of 5 September 1928,her married name was Swanson. Anne Lykken was born on 8 November 1907 at Union, South Dakota. She was the daughter of Isaac Olsen Lykken Sr. and Carrie J. Stene. Anne Lykken was christened on 21 November 1907 at Rosine Norsk Evangelisk Luthersk Menigheg (Roseni Lutheran Congregation), Beresford, Union, South Dakota. Anne Lykken died on 21 January 1967 at Union, South Dakota, at age 59 Mrs Stanley Swanson (Ane Lykken) obituary. She was buried after 21 January 1967 at Roseni Lutheran Church Cemetery, Beresford, Union, South Dakota, Anna (Lykken) Swanson burial notice. 1925 State Census, South Dakota Anne Lykken appeared on the census of 1925 in the household of Isaac Olsen Lykken Sr. and Carrie J. Stene at State Census, South Dakota. 1935 State Census, Emmet Township, Union, South Dakota Anne Lykken and Stanley Robert Swanson appeared on the census of 1935 at State Census, Emmet Township, Union, South Dakota. [S250] U.S. Federal Census 1930 U.S. Federal Census, by Ancestry.com, ED64-15. Dwelling 108. Stanley Robert Swanson was born on 16 March 1904 at Chicago, Cook, Illinois. Stanley Robert Swanson married Harriett Ball on 19 February 1978. Stanley Robert Swanson died on 2 April 1995 at Canton, Lincoln, South Dakota, at age 91 Stanley R. Swanson, 91, of Alcester, died Sunday, April 2, 1995, at the Canton-Inwood Memorial Hospital in Canton. Services will be 2 p.m. Thursday at Roseni Lutheran Church, rural Beresford with the Rev. Erika Lehmann officiating. Burial will be in Roseni Lutheran Cemetery. Visitaion will be noon to 9 p.m. Wednesday, with the family present 7 to 8 p.m., at Wass Funeral Home, Alcester. Mr. Swanson was born March 16, 1904, in Chicago, the son of Alfred and Amanda (Sand) Swanson. He moved to the Alcester area as and infant with his parents and was a life long resident. He farmed in rural Alcester until retiring in 1968. 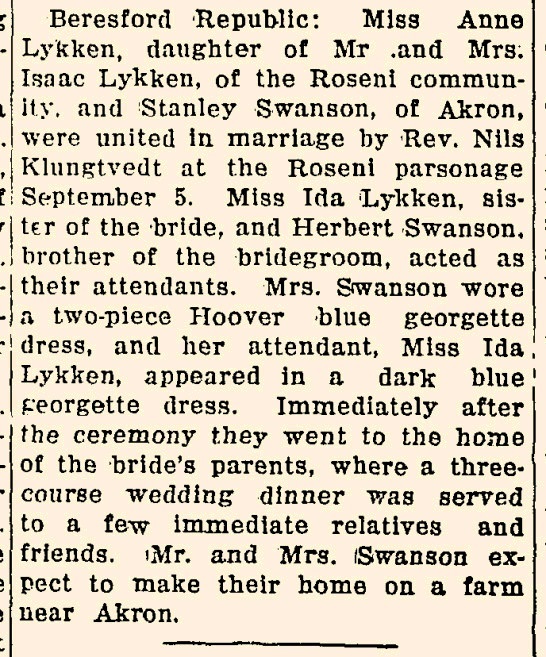 He married Anne Lykken Sept. 5, 1928. at Roseni Lurtheran Church parsonage. She died Jan. 21, 1967. He married Harriett Ball Feb. 19, 1978, at Union Creek Church in Akron, Iowa. Mr. Swanson was a member of Roseni Lutheran Church where he served as a trustee. He was a member of the Farmer's Union. Survivors include his wife; a daughter, Mrs. Curtis (Carolyn) Saugstad of Alcester; as son, Robert of Casper, Wyo; nine grandchildren; 11 great-grandchildren; 10 stepgrandchildren; two brothers, Arthur of Sioux City and Leonard of rural Akron, Iowa; a stepson, Pat Ball of Citrus Heights, Calif., and a stepdaughter, Mrs. John (Sharon) Paulson of Sioux Falls. He was preceded in death by two sisters; two brothers; a son Arden; a daughter, Arlene and and infant grandson. Funeral Service: 2:00 p.m., Thursday, April 6, 1995 - At Roseni Lutheran Church, rural Beresford, SD - Officiating: Rev. Erika Lehmann - Special Music: Grandchildren and Great-grandchildren "Children Of The Heavenly Father" - Organist: Mike Pedersen "Softly and Tenderly" - Accompanist: Marie Lykken - Duet: Lois and Rodney Anderson " No One Understands Like Jesus" - Congregational Hymns: #439 "What A Friend We Have In Jesus" - #107 "Beneath The Cross Of Jesus" - Casket Bearers: David Swanson, Verdell Swanson, Eugene Swanson, Wayne Buum, Merle Lykken, Kerwyn Lykken, Kenneth Bircher, Alvern Buum - Service of Interment: Roseni Lutheran Cemetery, Rural Bersford, SD. 1935 State Census, Emmet Township, Union, South Dakota He and Anne Lykken appeared on the census of 1935 at State Census, Emmet Township, Union, South Dakota. Stanley Robert Swanson obtained US Social Security Card at South Dakota; Last residence Alcester, Union, South Dakota. 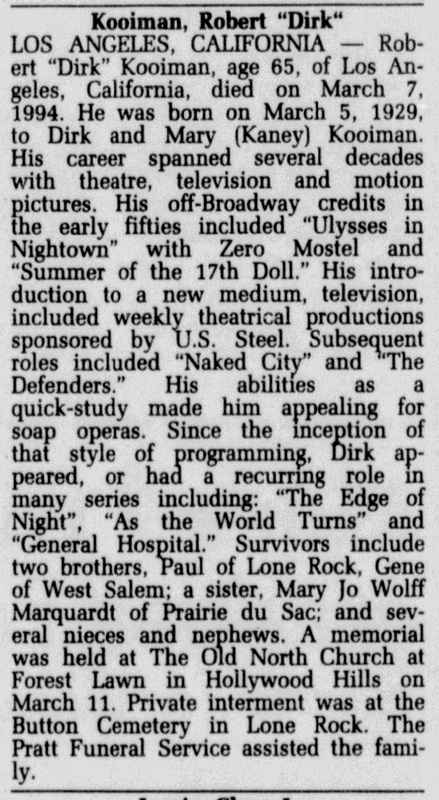 He lived in May 1962 at Alcester, Union, South Dakota. [S244] U.S. Federal Census 1910 U.S. Federal Census, by Ancestry.com, Year: 1910; Census Place: Sioux Valley, Union, South Dakota; Roll T624_1489; Page: 7A; Enumeration District: 429; Image: 539. Arden Irvin Swanson was born on 9 April 1929 at Union, South Dakota. He was the son of Stanley Robert Swanson and Anne Lykken. Arden Irvin Swanson was christened on 2 June 1929. He died on 5 October 1970 at LeMars, Plymouth, Iowa, at age 41. 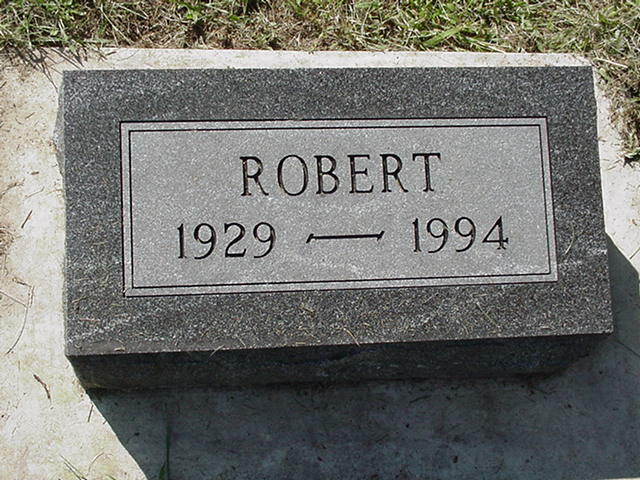 He was buried after 5 October 1970 at Memorial Cemetery, LeMars, Plymouth, Iowa. Married Name 2 October 1955 As of 2 October 1955,her married name was Onnen. Married Name 30 June 1961 As of 30 June 1961,her married name was Kanne. Arlene Shirley Swanson was born on 2 December 1935 at Union, South Dakota. 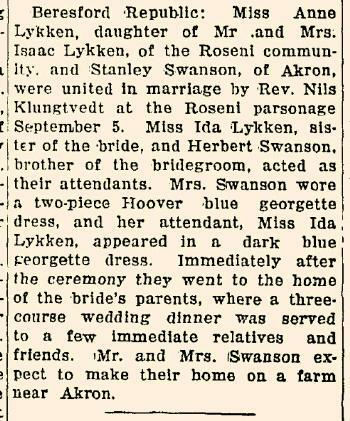 She was the daughter of Stanley Robert Swanson and Anne Lykken. 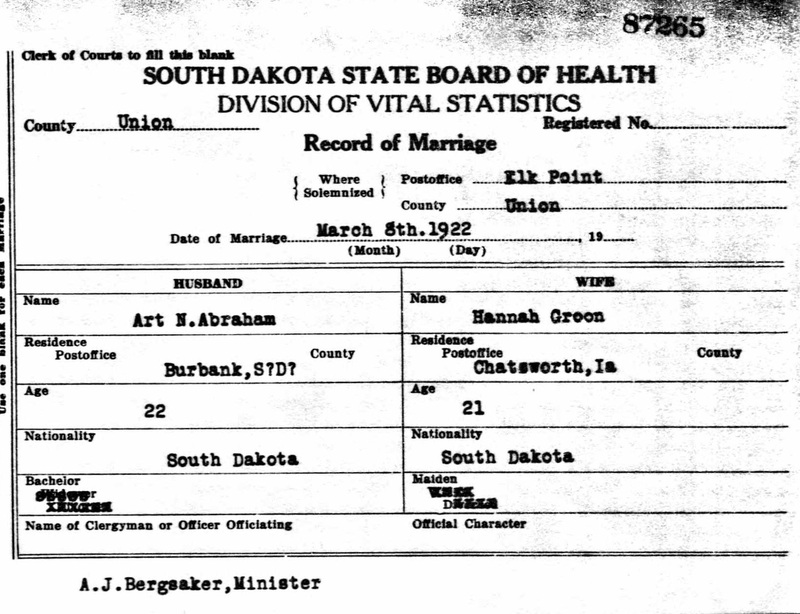 Arlene Shirley Swanson married Jerome Onnen, son of Richard F. Onnen and Ethel Ella Jans, on 2 October 1955 at Roseni Church, Union, South Dakota. Arlene Shirley Swanson married Floyd Kanne on 30 June 1961 at Windom, Cottonwood, Minnesota. Arlene Shirley Swanson died on 13 September 1965 at Akron, Plymouth, Iowa, at age 29.